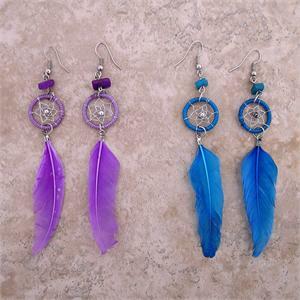 Feather Dreamcatcher Earrings - Set of 12 pairs, assorted colors. 3.5". Vibrant colored elegant feathers hang from dreamcatchers. Each is a little different. They are Fair Trade from Peru and help cottage industries there. See Repped Products section for other Andes Fair Trade Items. This line has a minimum of $100 and cannot be combined with the Light Stones products for the minimum. There are carved gourds, instruments, pottery, bags, purses, textiles, worry dolls and more.